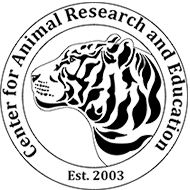 Center for Animal Research and Education : News & Events : Newsroom : CARE Gets Massive Updates!! This winter and spring has been exceptional for the animals here at CARE! 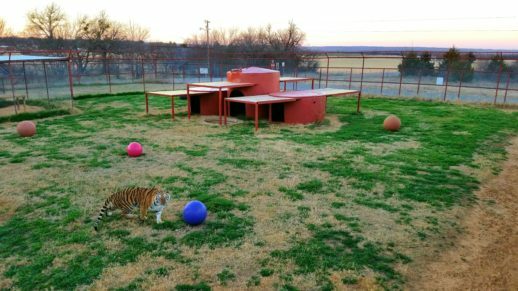 Many of our residents received fancy new upgrades to their enclosures. 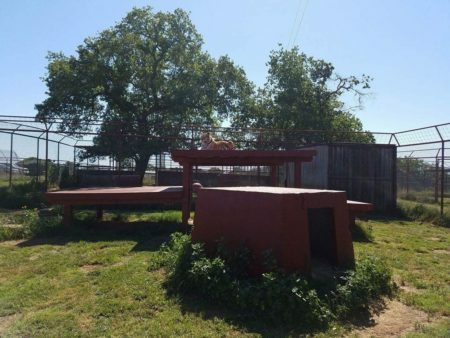 Executive Director Heidi has been designing both new platforms for many of the cats as well as lots of fun ramps, ladders, and platforms for the lemurs to climb on! 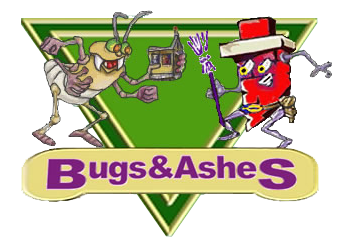 A huge thanks to Calvin and Pierre for going above and beyond with all of the construction and another GIANT thanks to the attendees of the 2017 Furry Fiesta in Dallas for raising the funds that allows us to complete all of these improvements!! 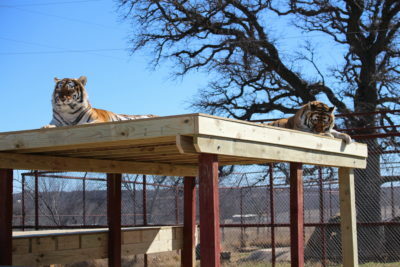 With the heat of the cruel Texas summer already knocking on our door, and the difficulty growing shade providing trees inside of the enclosures to shelter our many aging cats, platforms are essential! Not only that, but they serve as environmental enrichment, giving the cats built in scratching posts and lounging areas where they can keep an eye on the neighborhood! Fire, Boomer and Slade, Shaanti and Naya, Allie and Archie & Sydney and Rasa all have amazing new platforms (and the Babies are getting theirs soon)! Rasa didn't quite know what to make of the ramp on hers though, she thought maybe part of the platform fell down and she needed to fix it! Archie really liked that new platform smell! Shaanti and Naya got a whole set of new platforms! 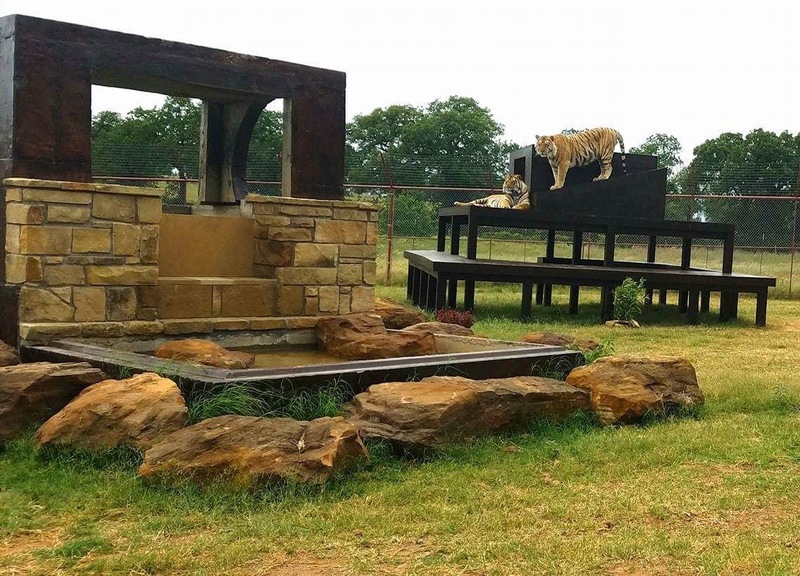 Not only did Boomer and Slade get an AMAZING super-sized platform, we finished their amazing double-decker pool and waterfall!! Of course, we had to test it out first to make sure that it was up to the boys' standards, so we invited the 2nd grade class at Bridgeport ES (who generously donated $1600 they personally raised for CARE that day) to put the structures through their paces! In addition to all the new platforms, a few of the cats needed new lock-down area boxes as well. In the winter, we pack these with hay and the cats crawl in to keep cozy and warm. In the hotter months, they like to hang out on top to catch some breeze! The four "Babies" (JP, Allucia, Jakey, and Luca) got some boxes. Those big tigers love to squish themselves into the space between the top of the box and the shade roof in the alleyway of their enclosure. We made sure to give them a little more space to get in there! The lemurs really won the lottery with their upgrades! Their poor old tree in their enclosure died a long time ago after the troop stripped it of its leaves.  So, we built them something even better! 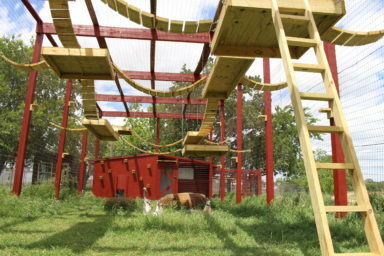 It is a top-notch lemur playground! So many places to climb, jump, and relax! 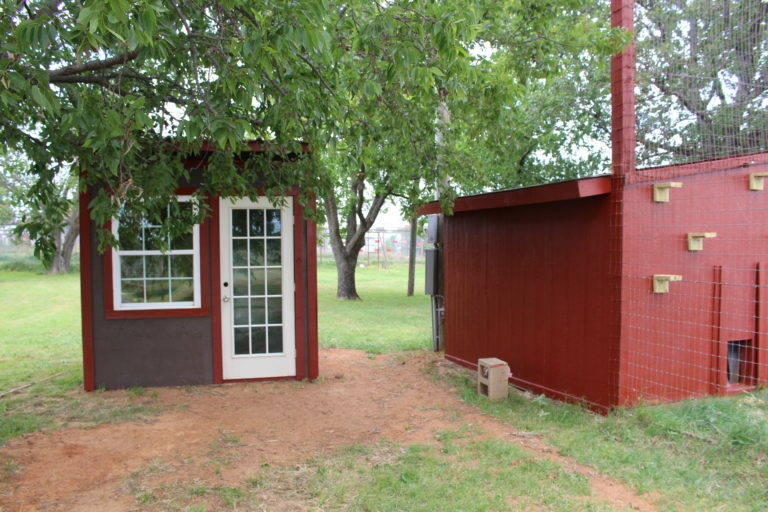 We even have a cute new well house that has room for lemur cleaning supplies and extra tools! 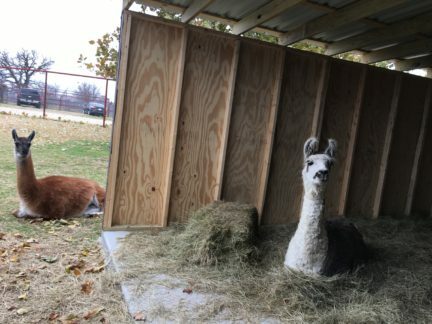 And, the llamas got a new house after their old one blew away in a storm (a special thanks to Charles Doubrava, his Eagle Scout group, and Decatur High School students for building the new shelter)! 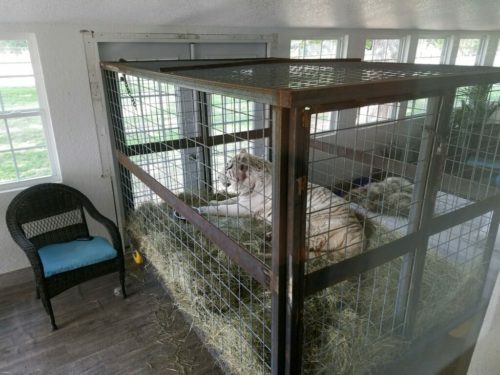 Last, but certainly not least, since we had Flash in critical condition, Calvin built an extra large transport cage (that has since come in handy for another big boy, Chompers). He also installed french doors in the sunroom. The room was originally designed for Araali and Zuberi's care when they were being treated for wobbler's. 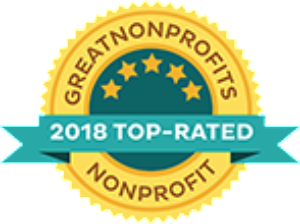 It has since been a recovery unit for Rita the lemur, a bobcat nursery for Max and Mia, and an ICU and care center for Ace, Flash, and Chompers. What an amazing gift this room was - allowing us to keep a close eye on the animals that need it and providing them a comfortable, climate controlled area where they can easily see outside through all of the windows, feel the breeze on their face in front of the double-doors, and watch cartoons on the big screen TV!